The Brand Camera Company was a camera maker in Los Angeles. The company made a rail-mounted view camera from about 1947. 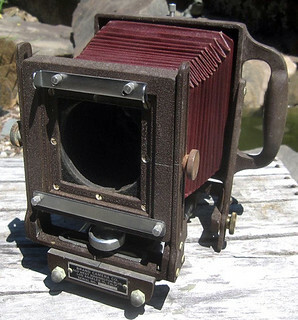 This appears to have been named as both the Brand Press View and the Brand 17 (referring to its seventeen-inch bellows); Brand's advertising suggests the camera is for use both hand-held as a press camera, when it may be fitted with a side-mounted flash and wire-frame finder, and as a studio camera. The front and rear standards are painted aluminium castings, mounted on two parallel rails. A cast handle is attached to the rear standard on the left side. There is a tripod mount (also an aluminium casting) between the two standards. The front standard pulls out from the tripod mount on a telescoping front section of each rail. The rear standard slides on the rear section of the rails for focusing, by cranking a central threaded rod, parallel to the rails and between them, which passes through the standard and is fixed to the tripod mount. It seems unlikely that this focusing mechanism would lend itself to use as a press camera. The camera has a rotating back, front rise and shift, and front and rear tilt and swing. None of the movements is geared: the standards are just unlocked and moved by hand. It has a spring back to accept standard double dark slides. Brand's advertisements offered a quarter-plate back as well as 4x5-inch. There is a second model of the camera from as early as 1948, in which the rear crank-focusing was replaced with focusing knobs on the sides of bed of the rear standard. The maker's plate on this camera identifies it as the Brand 17. The later model of the camera appears to be more versatile. The advertisement cited shows a sketch of the camera set up as a studio camera, with the rear standard mounted on the sliding bed with focusing knobs, with a folding hood fitted to the focusing screen, and using extensive camera movements. A second picture shows it set up for use as a press camera, with the front standard mounted on the focusing bed, and fitted with removable side-mounted flash, wire-frame finder and side-mounted rangefinder. The advertisement states that bellows extension is between 3½ and 17 inches. 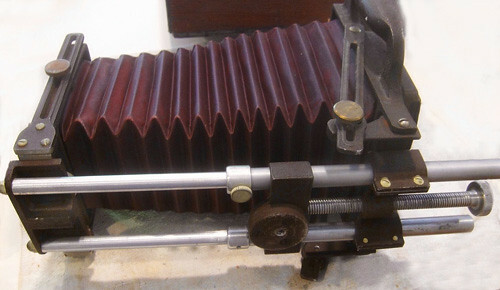 However, one modern-day user stated that the bellows prevents the camera being used with lenses shorter than about 127 mm (5 inches). British bird photographer Eric Hosking used a Brand 17 for some of his work. ↑ Brand camera (original model) offered for sale as Ebay item 122041979911, July 2016. The maker's plate gives the company address as 500 West Washington Bvd. ↑ McKeown, James M. and Joan C. McKeown's Price Guide to Antique and Classic Cameras, 12th Edition, 2005-2006. USA, Centennial Photo Service, 2004. ISBN 0-931838-40-1 (hardcover). ISBN 0-931838-41-X (softcover). p150. ↑ Advertisement by Peerless Camera Stores offering the Brand Press View (without lens) for $79.50, in Popular Photography January 1947, p25. Archived at Google Books. ↑ Advertisement by Brand Camera Co. naming the camera the Brand 17, in Popular Photography September 1947, p155. Also at Google Books. ↑ Forum discussion about the Brand 17 camera, begun September 2005, at photo.net. One posting includes a picture of both models of the camera. ↑ Second discussion of the camera dated 2010, also at photo.net. ↑ Hosking E.J. & Hale, W.G. (1983) Eric Hosking's Waders, Pelham Books. p178. This page was last edited on 16 July 2016, at 00:36.